"for Engineering, Mathematics, Science, Computer, and Technology." The primary purpose of this page is to provide you with a jump point to various Tech resources that are available on the WWW. I have also included some very sparse information on Tech which may or may not grow depending on the growth of the other Tech sites and the time constraints of my studies. I have also included e-mail addresses for some Tech alumni (which I hope will grow) as well. If I am missing any other Tech Sites or if you have any comments, please e-mail me at cc73@cornell.edu. 10/10/04- A number of the links below are inactive. These are indicated by an Asterix (*). I haven't removed them from the list as I'm not sure if they have relocated or more likely, have just been removed completely from the internet due to various reasons. If anyone has any information on the whereabouts of these pages or new BTHS-related pages, please e-mail me to let me know so I can keep this page up to date. Thanks. The Official Brooklyn Techincal High School Homepage. Brooklyn Tech has an official presence on the web. This site contains information on the school, along with its current school year calendar, events, and a Tech in the News section. A good beginning to learn about the history and present of Tech. The Brooklyn Tech Parent Teacher Association Calling itself, the only fully interactive Brooklyn Tech Web site on the Internet, The Brooklyn PTA site has chat rooms where they are planning to hold meetings so that parents who normally do not have the time to make the trek to Fort Greene can get involved with their child's school. This sites looks to be very promising in helping this cause. The Brooklyn Tech Alumni Page: Maintained by Anders Hammarquist Electrical Engineering '92 and it contains the mailing list archive of the BTHS ENEWS newsletter as well as a searchable index of alumni on the list (which as of 7/14/00 continues to be down, let's hope it gets back up soon!). It's based in Sweden (random factoid) and it's pretty cool if you are looking for a former Tech friend. (This is also the sight where I "got" the background logo and the picture of the Tech building. Sorry Anders). BTHSNews: Maintained by current Technites. BTHSNews is an online community of current students as well as alumni, with discussion forums, announcements, and news on Tech and Tech-related topics. The Brooklyn Tech Home Page(*): This site is maintained by Timothy Wu Bio-Med '95 and Howard Hao Bio-Med '95 and is now in its third (and its neatest) incarnation. It was formerly known as the BTHS Web Campus Information System which was formerly known as the BTHS Virtual Campus Web for all of 5 days =). Explore and see for yourself. It's a pretty awesome site. It contains many New York Times articles concerning Tech as well as loads of information on the history of Tech. 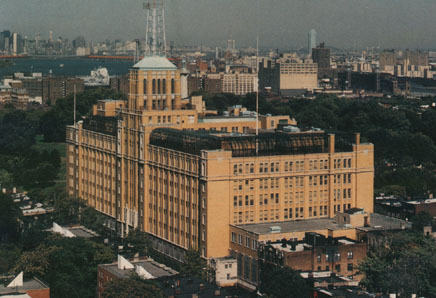 Brooklyn Technical High School(*): This site provides information about all the majors, various student activities, some neat pictures of the interior of Tech, and some statistics on Brooklyn Tech. It's maintained by MSI majors and is worth a look. The Unofficial Homepage of Brooklyn Tech(*): Maintained by Tech Alumnus Daniel Shvimer, this site is rather creative and provides much insight into what is happening at Tech NOW from a student's perspective (providing a different POV than what comes from alumni and under the official banner). The site has numerous pages that seem to grow in content each day as Daniel comes up with more ideas. This site originally started out when Daniel was a junior and it was very refreshing to see current students but their thoughts on Tech on the Web. I can only hope that current students would place their feelings on Tech on the Internet to pass on its spirit. Official Homepage of Brooklyn Techical High School's Environmental Science Major Maintained by Tommy Chung '99 this site provides a great look into Tech's Environmental Science Major, including course descriptions, faculty contact info, and recent news. It's worth a look to see what this recent addition to the Tech major (hey, the Class of '94 graduated the first ES majors, so it's recent to me!) has to offer. Mr. Chung has taken great care to make this site user friendly and attractive. Brooklyn Guestbook Page - Maintained by Bruce Tuchman - This site contains guest books to several Brooklyn area high schools and neighborhoods, including Brooklyn Tech. There are also pictures of Sheepshead Bay. Find a long lost classmate or fellow Brooklynite. Brooklyn Tech Volleyball(*) - Maintained by Lucas Ostrowski '02 - This site contains a team schedule with results and pictures of the volleyball team. Professional Photographer Goes Back to High School - Maintained by Stanley Rowin '67. This site contains awesome professional pictures of the refurbished auditorium and other Tech sites circa 2000. Definitely worth a look (maybe he should be hired by Tech to do a web photo gallery). The Alumni Association is really interested in getting into contact with Tech Alumni of all ages. Please contact them and join. It is a great opportunity to support the high school where we grew up in and loved (that is if you did like going to Tech). Also, their site contains some interesting information about Tech's history and plans for the 75th Anniversary of Brooklyn Tech.